The Carolina Herrera Spring/Summer 2014 Collection is influenced by kinetic art, especially the work of Jesús Rafael Soto. Another Jesús Rafael Soto-inspired collection : Octavio Pizarro Spring/Summer 2014 (the prints of this collection, titled « From Soto to Soulages », are based on Jesús Rafael Soto). 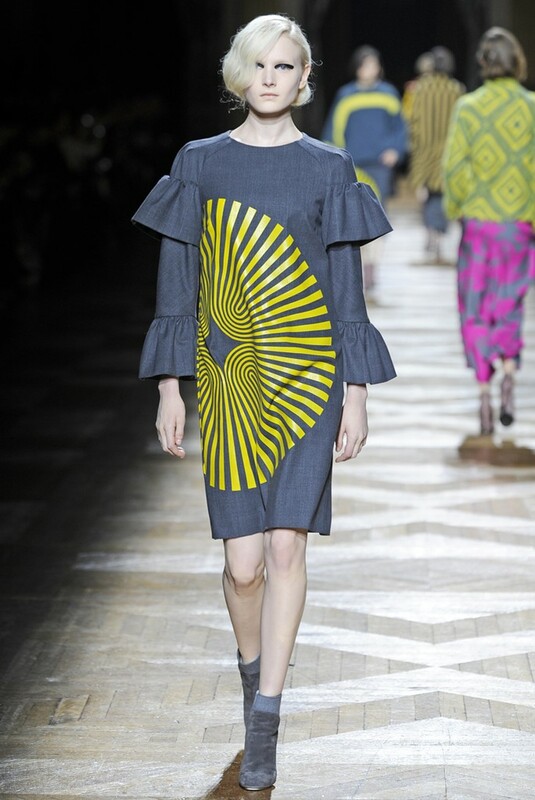 The Holly Fulton Autumn/Winter 2013-2014 Show highlighted M. C. Escher-style geometric cubes. 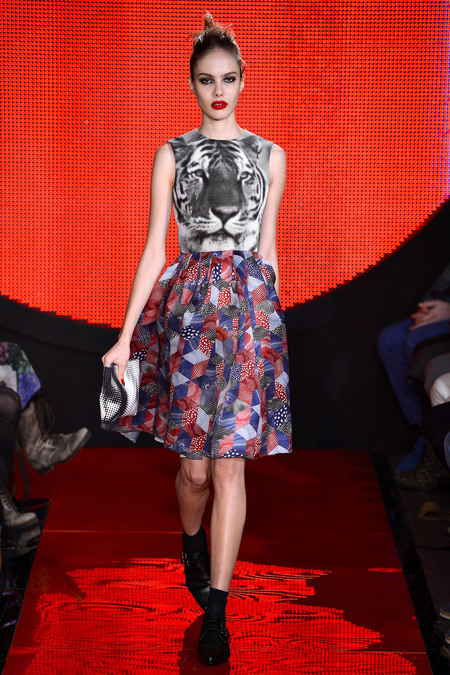 Some M. C. Escher-influenced collections : Diane von Furstenberg Autumn/Winter 2013-2014 (the black and white motifs in this show echo M. C. Escher’s drawings), Eley Kishimoto for Clarks Originals Spring/Summer 2013 (the « Desert Boots » that Eley Kishimoto customized for Clarks Originals are decorated with M. C. Escher-inspired motifs), Ichiro Suzuki (the menswear collection that Ichiro Suzuki presented in July 2012, as part of the 2012 International Talent Support competition, was inspired in part by M. C. Escher’s optical works), Issey Miyake by Dai Fujiwara Autumn/Winter 2011-2012 (M. C. Escher influenced the optical illusion pieces of this collection), Jonathan Saunders Spring/Summer 2004 (this collection referenced, among other things, M. C. Escher’s optical works), Jonathan Saunders Autumn/Winter 2009-2010 (partly inspired by M. C. Escher), Loewe by Stuart Vevers Spring/Summer 2012 (this collection, which featured M. C. Escher-influenced tile and lizard prints, celebrated the 75th anniversary of M. C. Escher’s trip to the Alhambra in Granada), Marco de Vincenzo Spring/Summer 2012 (some knitted dresses were reminiscent of M. C. Escher’s lithographs), Matthew Williamson Spring/Summer 2006 (some prints were based on M. C. Escher’s works), Narciso Rodriguez Autumn/Winter 2012-2013 (M. C. Escher-inspired motifs), Neil Barrett Spring/Summer 2012 Menswear (some motifs were inspired by M. C. Escher), Paul & Joe® Resort 2013 (M. C. Escher-inspired patterns), Paul Smith Autumn/Winter 2013-2014 Menswear (some knits evoke M. C. Escher’s works), Rag & Bone Spring/Summer 2012 (optical M. C. Escher-style motifs), Ter et Bantine Spring/Summer 2013 (M. C. Escher-style cube prints), Tomohiro Tokita (the sci-fi menswear collection that Tomohiro Tokita presented in 2010, when he was graduating at the Fashion department of Antwerp’s Royal Academy of Fine Arts, featured M. C. Escher-influenced prints). Furthermore, the James Lima-directed « Fallen Shadows » film (showcasing Prada’s Autumn/Winter 2008-2009 collection), screened on September 2008 in Prada’s Broadway Epicenter, partly took inspiration from M. C. Escher. 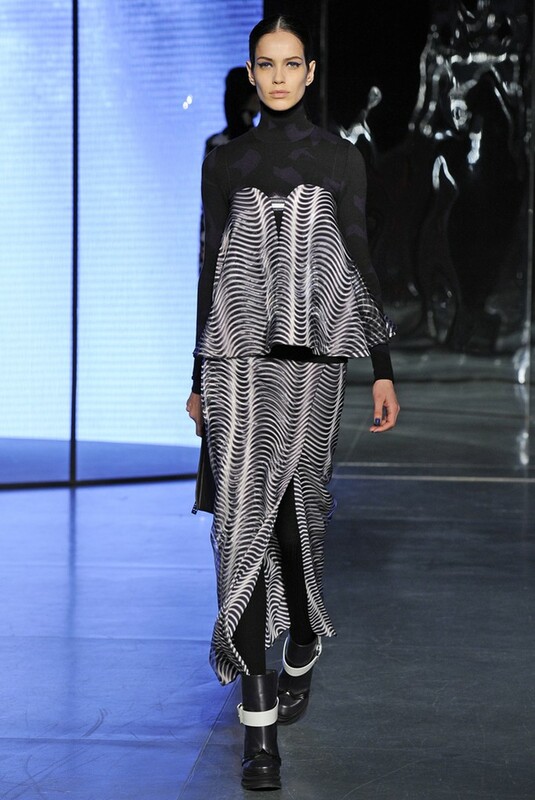 The checkerboards in the Marc Jacobs Spring/Summer 2013 Show echoed Victor Vasarely’s motifs. Other Victor Vasarely-influenced collections : Ichiro Suzuki (the menswear collection that Ichiro Suzuki presented in July 2012, as part of the 2012 International Talent Support competition, was inspired in part by Victor Vasarely’s optical paintings), Jean-Louis Scherrer by Stéphane Rolland Couture Autumn/Winter 2005-2006 (Victor Vasarely-inspired woven motifs), Jonathan Saunders Spring/Summer 2013 Menswear (Victor Vasarely-influenced pieces), Marie José Morato (in 2010, she developed a hologram jewelry line as an homage to Victor Vasarely), Orla Kiely Autumn/Winter 2005-2006 (a printed top echoed Victor Vasarely’s paintings), Pedro Lourenço Spring/Summer 2011 (as a starting point of this collection, Pedro Lourenço stuck photocopies of Victor Vasarely’s paintings on his mood board), Pierre Hardy Autumn/Winter 2009-2010 (Victor Vasarely-inspired optical print on leather hi-top sneakers), Pino Lancetti 1968 (Victor Vasarely-inspired collection), Ports 1961 Pre-Fall 2012 (Victor Vasarely-style prints).